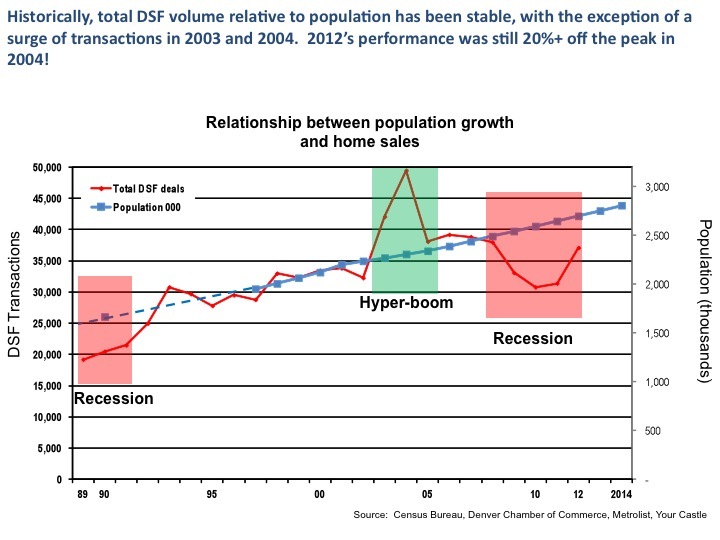 Charles Roberts explains Denver’s real estate market cycle and the relation between population and homes sold. The big headline these days in the Denver real estate market is the massive drop in inventory (homes for sale) over the past couple of years. In December, 2007 there were 27,127 homes and condos on the market in metro Denver. As recently as December, 2010 there were 14,275 properties on the market. Today there are only 10,993. We have to go all the way back to 1999 to see inventory this low. This massive drop in inventory in the under $300k market segment has profound ramifications for our local real estate the market. Let’s start with a simple supply and demand discussion. Supply = the inventory of homes on the market. Demand = the number of buyers looking for homes. Currently, supply is at a 12 year low. In 1999 when supply hit its lowest point in a decade, prices began rising simply because supply couldn’t keep up with demand. Prices rose for about 8 years until inventory reached over 27,000 properties in 2007. At that point in the housing cycle supply surpassed demand, causing prices to begin to fall. Simple economics. Compare the 1999-2007 housing cycle to today’s environment. We currently have a 12 year low in inventory – just as we had in 1999. There is simply not enough inventory to keep up with demand. When I work with buyers we have to look long and hard to find quality properties. This is very different from a few years ago when supply was high. Sellers are starting to understand that the tables have turned (in the under $300k market) and are holding firm on prices and bargaining harder on concessions and inspection items. The market has changed and we have to be quick to adapt. The imbalance between supply and demand has already affected the market. In the past 12 months the price of homes under $85k has risen a massive 19%. Homes between $85k and $135k are up 10%. Homes from $135k – $210k are up 6%. It’s only when you get to prices above $300k that prices are still dropping (down 13% for homes priced above $460k). As we discuss every month, the key to buying or selling a property successfully is to understand what the market is telling us. Right now it’s telling us that there are not enough homes on the market in the under $300k segment and the market (i.e. sellers) is responding rationally to this change. Please feel free to call me to discuss this further and see how you can make this market work for you. Our Metro Denver housing market continues to surprise and confound! For example, just when you thought the luxury market was dead and gone it starts to rebound. Two separate reports released last week suggest there is life yet in the high-end market. In the first three quarters of this year, sales volume for luxury homes totaled $608 million for single-family homes, up 1% from the first nine months of 2010. The number of homes sold was up 3% to 395. For luxury condos, sales volume in the first three quarters soared 36% to $45 million from the same period last year. But, while the inventory of million dollar homes has shrunk significantly from last year there still remains a large inventory of these homes. Stay tuned. Of course, the majority of the market is under $300k. As a matter of fact, 71% of all home purchases in Metro Denver are $300k or less. Here’s how it breaks down: $0 – $99k = 13% of the market. $100k – 199k = 32%. $200k – $299k = 26%. The bottom line is that, despite everything you hear in the media, our market is surprisingly strong and vibrant, with even the high-end having appeared to bottom out.